The base stations should be installed at a maximum of 5 meters from each other. More than 5 meters may work, but it is outside the recommended specification. One base stations has to be in b _mode and the other base station has to be in _c mode. You can change the mode of operation by pressing the button at the back of the base station. We recommend installing the base stations at opposite corners of the room. To reduce occlusion, we recommend installing the base stations at a height of around 2 meters. They should be pointing slightly downward: they have a cone of vision of 120 degrees vertically and horizontally. More than two base stations is not supported. The base stations are synced optically. They have to see each other to work. You can also see part 1 and 2 in the HTC Vive PRE Installation Guide. Part 1 will explain the room configuration. Part 2 will explain how to install the base station. 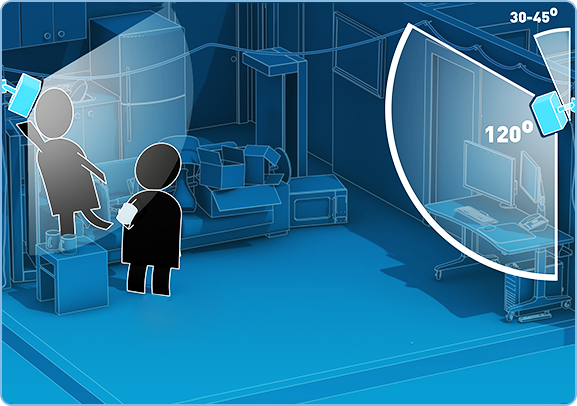 The other parts in the HTC Vive PRE Installation Guide are not applicable as you are using the Otus tracker. If you see an “!” beside the base stations icon in SteamVR, you can update your firmware. Please follow the instructions from HTC here. Tracking will work even if you do not update your firmware. 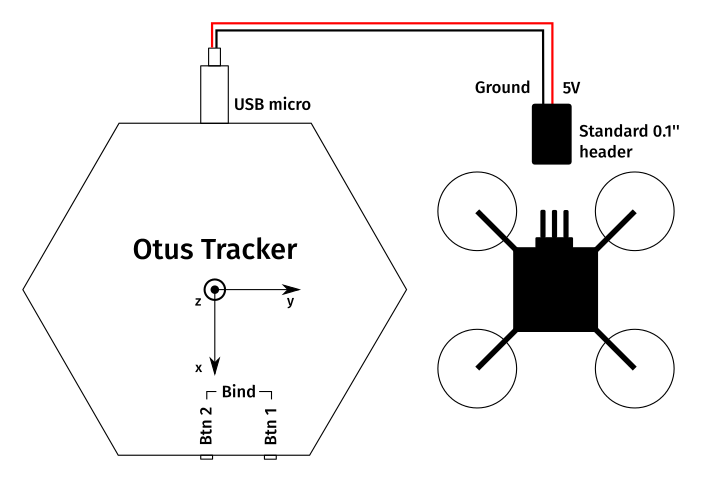 To test tracking, connect the Otus tracker to a USB port on your local machine via the USB A to USB mini cable. Launch the RCbenchmark Tracking Lab software. The SteamVR control panel should launch automatically. The tracker has to see at least one base station to start tracking. Two base stations in sight are required for best tracking performances. If you are losing tracking when the robot is running, you may need to install the included foam vibration dampers. You need three dampers per tracker. The accelerometer resonates when it experiences high frequency vibrations. We cannot filter the vibrations electronically: the tracker has to be mechanically isolated. This is why we included small vibration dampers. You can download the CAD model of the Otus tracker here (FBX, OBJ and STL). It can be used for visualisation in your software or for 3D modeling. The model has been simplified to reduce the polygon count and increase performance when used in real time visualisation. 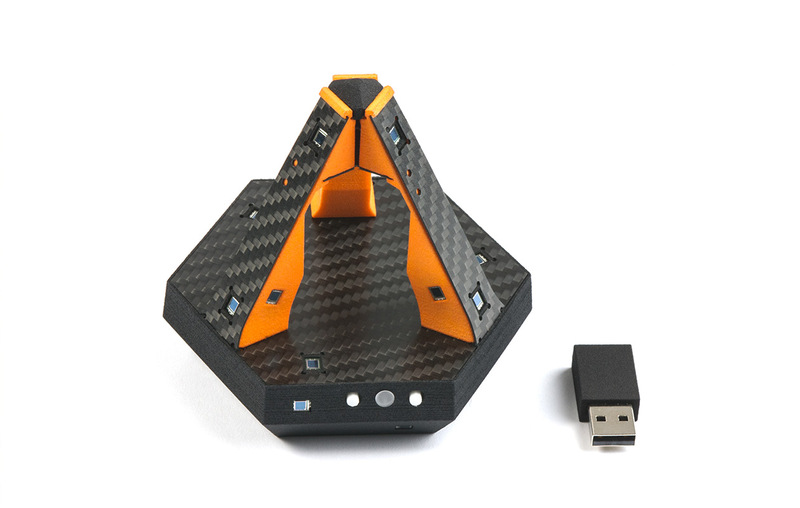 The Otus tracker is powered from a 5V power source from your UAV or robot when used wirelessly. This is to reduce weight. Follow the connection diagram on the following image. Connect the wireless receiver to the USB extension cable and the USB extension cable to your computer. The USB extension cable is not necessary, but it will reduce the risk of losing tracking due to electromagnetic interference. Your Otus trackers come paired to their wireless receiver by default. If you want to pair the unit again, right click the controller icon in SteamVR and click “Pair Controller”. Then, press and hold the two buttons on the Otus tracker until the LED flashes blue. Once the LED is solid blue, the trackers are paired. Proceed to the software setup in the next section.